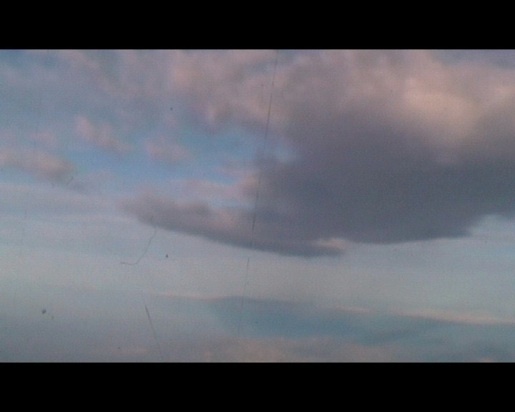 A floating screen in a darkened room looks out from a plane’s window as it soars through clouds. Small scratches on the pane are detected by the lens of the camera as the plane rises higher. On two floor-based speakers, an excerpt plays from Michael Powell and Emeric Pressburger’s 1946 classic. June: Request your position. Come in, Lancaster. Come in, Lancaster. Peter: - nil, repeat nil. Age - 27, 27, did you get that? Very important. Education - interrupted, violently interrupted. Religion - Church of England. Politics - Conservative by nature, Labour by experience. What's your name? June: Received your message. We can hear you. Are you wounded? Repeat. Are you wounded? Are you bailing out?